This is my Dad’s recipe for Manhattan clam chowder. He’s the one who taught me how to cook when I was a ‘lil’ fisherman’. When I was young I would go out and dig up clams out in Moriches Bay. They were rather plentiful back then, and there weren’t any restrictions on eating local clams. Or at least none that I recall, but what did I know, I was just one of those slacker teens. Well, the clams that I returned with would be steamed and eaten that way, Dad used canned clam in his chowder. Dad would start with sautéing the onion in a little olive oil in a pan. In the soup pot he would put about two cups of water with the celery and carrots and cook them until al dente. Then he would put the onions, diced potatoes, cut up tomatoes, bay leaf, thyme, garlic powder, and salt ‘to taste’. As he says you cook this until the potatoes are done. When they are ‘done’ add the two cans of clams with their liquid. Stir this all together, and turn the heat to simmer and in a minute or two serve it up. Perhaps with a side of freshly gotten clams steamed in their own juice. The ingredients were pretty straight forward. I think he used local Long Island potatoes. If he was making a big batch, he would split the pot before the potatoes were done. At some point in the cooking, when the potatoes were ‘half-done’ as he said, he would transfer half of the chowder into a separate pot and add one can of clams to each pot. Then the ‘hot pot’ was returned to the low heat on the stove, and the second pot was allowed to cool down. This second pot, once cooled to room temperature was ladled into plastic containers and put in the freezer. He did this because the potatoes, once fully cooked would turn to mush if you thawed out frozen finished chowder. Ice crystals formed in the frozen potatoes once thawed was the culprit that turned those potatoes mushy. So he figured that if you froze the potatoes in the chowder before they were cooked, they would be too dense for large crystals to form, and so they would not turn to mush when the chowder was thawed out. But you do have to finish the cooking once you do thaw the chowder out. 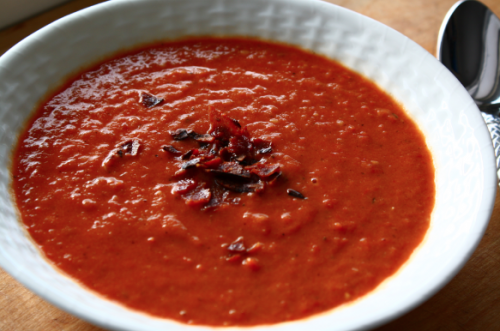 So, for my second blog, I will combine two of my favorite things, soup, and seafood. 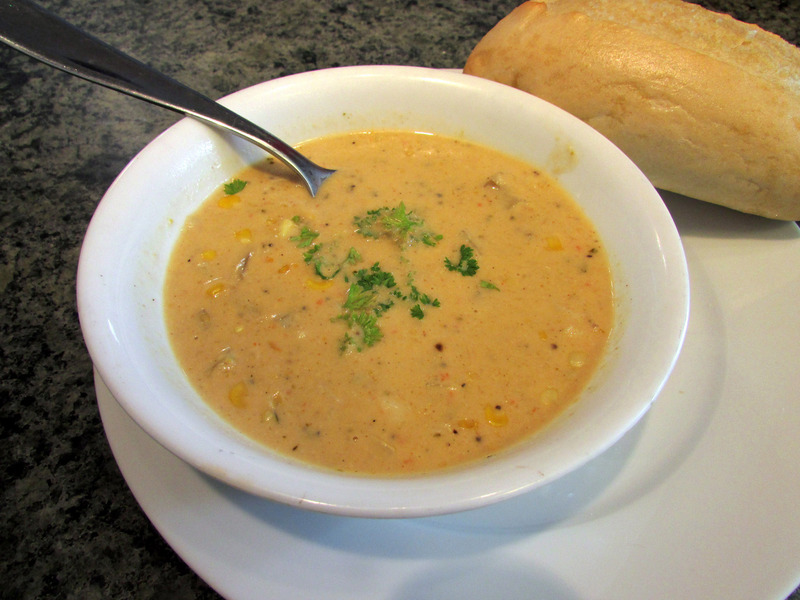 Yes, today’s thoughts are of ‘chowdah’… the New England style clam chowder popular in these parts. I always refer to the New England style as ‘chowdah’ and the Manhattan version as ‘chowder’. I start by rendering two rasher of thick cut bacon diced, then, add the diced mushrooms to brown with medium heat on the stove. Then toss in the pat of butter, let that fully melt, then whisk in the flour to create a roux. I generally cook it to a blond roux because gentlemen prefer blonds (or so I’ve heard). Once the roux has developed, I add a little of the water to deglaze the pot. Then I toss in the potatoes and add more water to just cover them. Let them get a little head start in the pot with a shake or two of sea salt, after a few minutes add the diced celery and carrots and bay leaves and enough water to cover them. Once the veggies have softened a bit, and the broth becomes fragrant, reduce the heat to a simmer and add in the half and half, and the can of clams. Now, I prefer not to drain the can, I add the liquid straight into the pot with the clams. Let this blend in and meld with the rest of the ingredients. When the chowdah is ready, I like to serve it in a wide, somewhat shallow bowl. But before ladling the soup into the bowl, I toast up a slice or two per bowl of any left over Italian bread. I put these toasts in the bowl, and then ladle the chowdah over them, but most folks are happy to stick with oyster crackers. This is also an opportunity to use up any left over biscuits that might be lying around, placing them in the bowl before the chowdah. I have found that creating the roux at the start of the process goes a long way in creating the thick and creamy texture that I like at the end of the process. Now, there are some cooks who prefer to thicken their chowdahs not with roux, but by using more, starchier potatoes, like Idaho’s, and mashing some of them in the cooking process to release their additional starch, but I find those chowdah too lumpy and not silky. Now, as to the bacon, I use the thick cut rashers which I find at Western Beef market. This chain of grocery stores features a large meat department in a separate room off the main store and you have to walk through one of those thick plastic strip-doors to get to it. It’s always nice and cold in there. 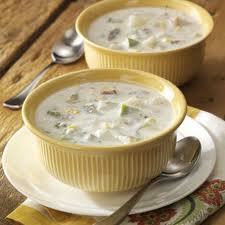 Some more traditional recipes use salt pork instead of bacon as the fat of choice for the chowdah. This is a good use for salt pork, but I tend to prefer the ‘smokiness’ that the bacon brings. The mushrooms are not a needed part of the chowdah, and I only add them to stretch the bacon and clam ingredients. 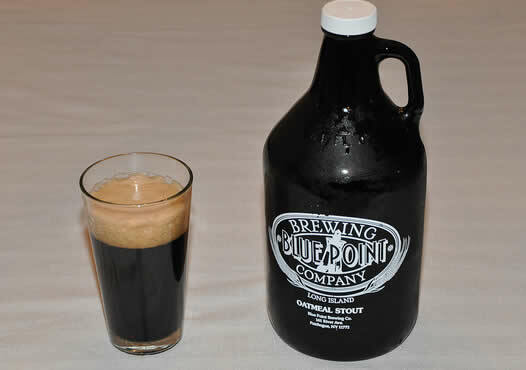 I find that I can get the mushrooms on sale for about a dollar to a dollar fifty per pint. If you skip the mushroom, then add an extra rasher of bacon, and another can of clams.